Using observations of molecules in the protostar L1527 taken by the ALMA observatory in northern Chile, a group of researchers have uncovered new clues to understanding how dust in a collapsing molecular cloud can shed angular momentum and penetrate beyond an area known as the 'centrifugal barrier' to find its way to the surface of the forming star. 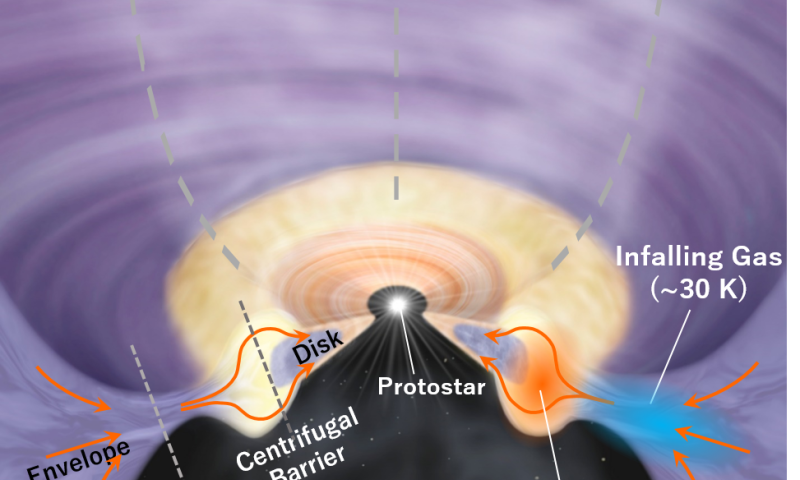 Previously, Sakai had discovered, from observations of molecules around the same protostar, that unlike the commonly held hypothesis, the transition from envelope to the inner disk—which later forms into planets—was not smooth but very complex. "As we looked at the observational data," says Sakai, "we realized that the region near the centrifugal barrier—where particles can no longer infall—is quite complex, and we realized that analyzing the movements in this transition zone could be crucial for understanding how the envelope collapses. Our observations showed that there is a broadening of the envelope at that place, indicating something like a "traffic jam" in the region just outside the centrifugal barrier, where the gas heats up as the result of a shock wave. 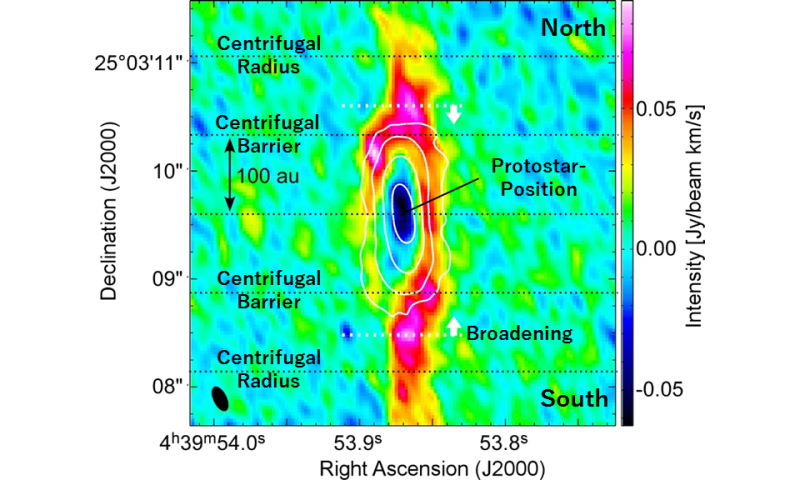 It became clear from the observations that a significant part of the angular momentum is lost by gas being cast in the vertical direction from the flattened protoplanetary disk that formed around the protostar." These observation results were published as Sakai et al. "Vertical Structure of the Transition Zone from Infalling Rotating Envelope to Disk in the Class 0 Protostar, IRAS04368+2557" in the Monthly Notices of the Royal Astronomical Society in February 2017. No mention in the article of the filaments which have been observed reaching into these star-forming regions, nor the filaments which connect sets of stars forming all at once. That is because no such thing is observed. Give a reference if you think you know otherwise. In fact, as usual, you seem compelled to invent whole swathes of imaginary physics to support your pseudo-scientific claptrap.